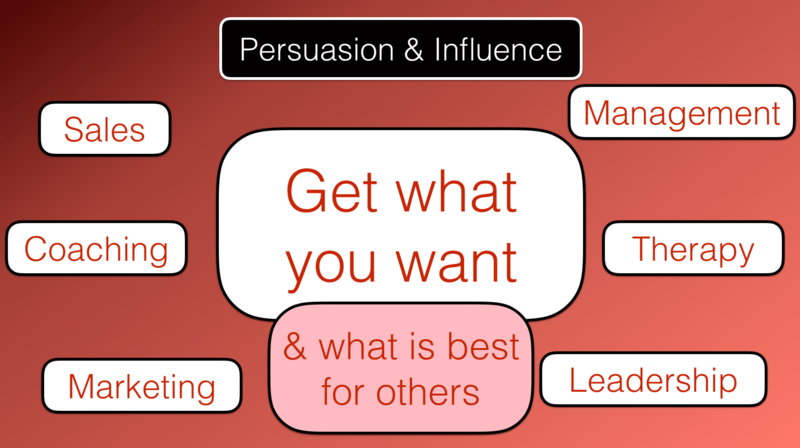 In the first part of this series we introduced a four stage process for persuasion and gaining influence. 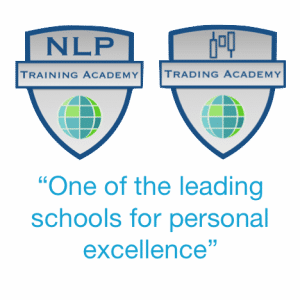 We talked about the importance of being in a position to influence and how to get into that position using a process of gaining rapport (from NLP). 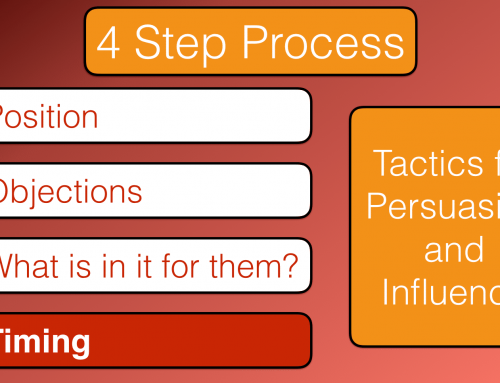 Having got into a position to influence and persuade someone we now move on to stage two of the process. Handling and overcoming objections. Take the conversation toward the subject that you wish to discuss (and the proposition that you would like the other person to agree to). Discuss your specific service or product in selling and marketing environments. Talk about the specific problem in therapy, the objective or goal in coaching. Discuss the specific activity that you wish for them to take action on. 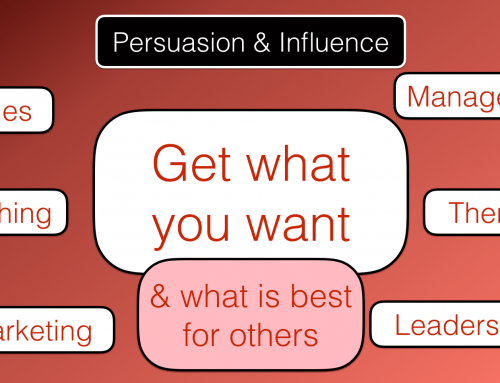 Hold back at this stage from persuading and influencing, you are not ready for that yet! Discuss it in general terms without suggestion, demand, or request. Your aim in this section is to gather information. You want to know their opinions, their beliefs, their perceptions. To them their perceptions are reality. They might not be right but they think that they are. How are they seeing things? 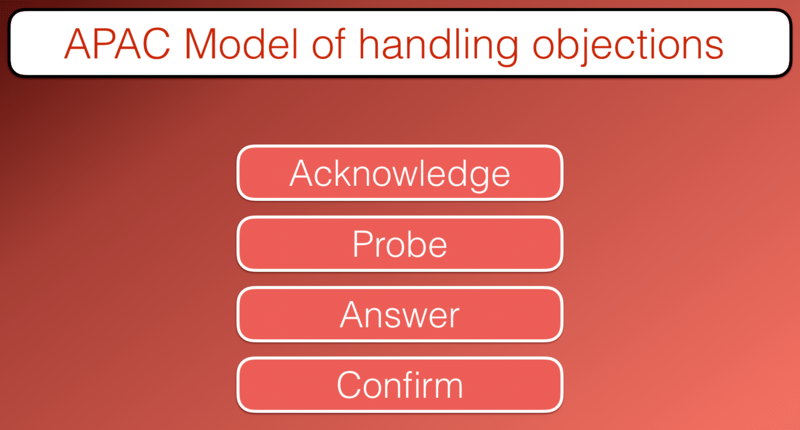 Find out by asking questions, probing. What objections are likely to surface when you ask them to go ahead? If you are selling or marketing remotely and you can’t speak to them then you need to preempt any objections. Do your market research. What are the likely and common objections that people have? Beliefs: If someone says “I believe” or “I don’t believe”, “I can” or “I can’t”, “I will” or “I won’t, “I think” or “I don’t think” then they are expressing beliefs. Are the beliefs in your favour or are they an obstacle? 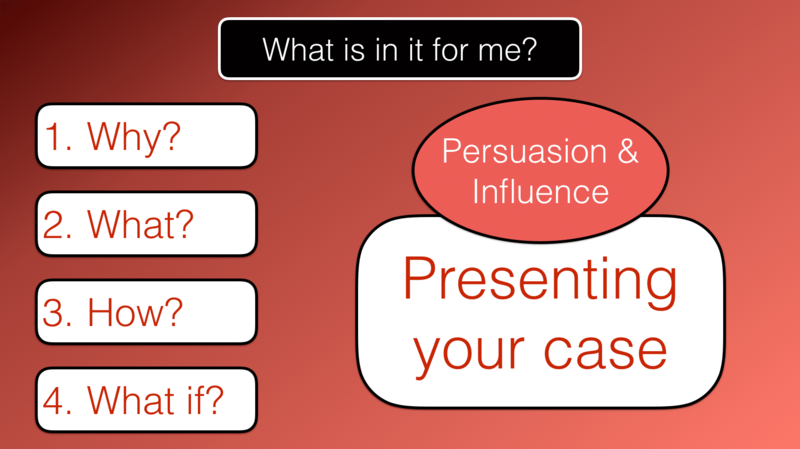 These are possible objections that need to be overcome before you can persuade and influence. Most people see objections as something that need to be avoided. They will almost always be present in some form or another. Most people see them as a negative thing but they are hugely positive. Mostly they are hidden, under the surface and you need to dig them out (or remove the outer layer) and release them by asking questions. If you are in sales or marketing or providing a product or service, coaching or in therapy then they are the reason for your existence. If the person didn’t have any objections then they would already have bought your product or done what you are about to suggest. “I hadn’t thought about doing that”, “I didn’t realise that I could do that”. Not realising that it was possible for them or available to them is an obvious obstacle, an objection. You may be able to avoid surfacing an objection and persuading someone to do something but it will result in problems. Any objection that still exists when someone agrees to something will eventually play on their mind. This is the reason for buyers remorse. It is the reason for half hearted action, a lack of commitment and poor results. Sometimes the objection will never fully surface and it will just leave someone feeling uncomfortable about doing something, it will leave a bad feeling, a gut feeling that something is not right. Ask questions and discover the objections. Once you have their objections verbalised then you can deal with them and put their mind to rest. Just before I give you the model for overcoming objections it would be a good exercise now to write down some objections that you are getting from other people at the moment. It could either be in a work context or on a personal level. For example if you are in selling, what are the common objections that your customers give you? Or if you are leading others what are the objections that you get from your staff? Or your clients if you are coaching, giving therapy? Just spend a couple of minutes now, (pause the video) and write down a short list of some of the objections that you are facing or expect to face in the future. Great. 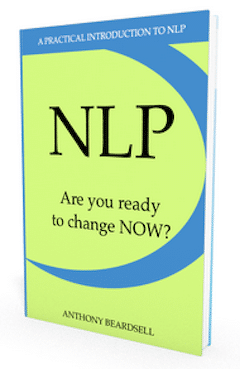 Now you have your objections let’s have a look at how you are going to overcome them. Whenever you have an objection to something that you suggest then you have a break in rapport. We first of all need to reestablish rapport by pacing their experience and their model of the world before we can begin leading them again towards what we want. 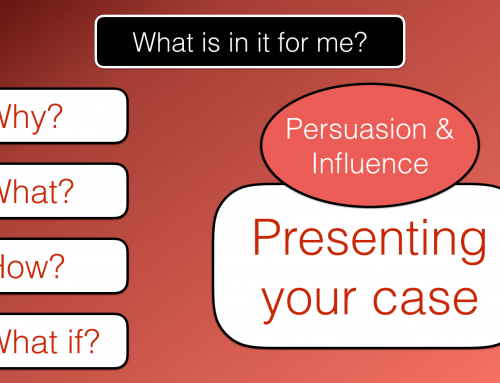 This objection handling model is called the APAC model. It isn’t my model but I did spend 15 years using it and it is super effective. 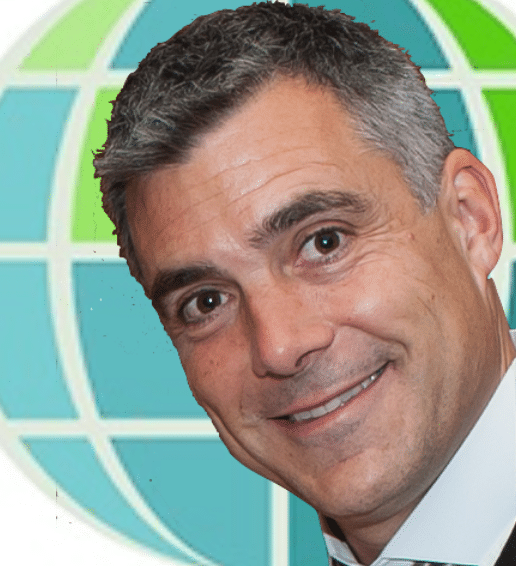 APAC stands for Acknowledge, Probe, Answer and Confirm. First of all you acknowledge the objection. This is done to rebuild rapport (which suffered a blow due to the objection). You agree that their objection is important and valid. You match and mirror their body language as you acknowledge the objection. Use the agreement frame. Avoid the use of the word BUT, use AND instead. This stage may only take a minute or less to complete or it may take longer if you have had an outright rejection. Once rapport is rebuilt and you can feel it move on to the next stage. Ask them questions. Assume that the reason for their objection is valid. It is for them. Your aim is to find out what the reason is for their objection. What are they thinking? How come they don’t see it the way that you see it? Avoid any questions beginning with the word WHY. Use WHAT, HOW, WHICH instead. WHY has accusatory connotations, it sends the message “Justify yourself”. It builds resistance rather than melting it. Don’t forget that rapport is only present when you are matching and mirroring the other person. At this stage in the process you need to understand their thought processes so that you can match them and lead them forward in the direction that you want to go. We have acknowledged their objection, we then ask them questions so that we can understand their thinking and fully understand the objection. Once you can see exactly how they are thinking the way that they are thinking, once you can fully understand the objection then you have asked sufficient questions. If you ask questions and still don’t have a valid reason or can’t see what the problem is then you need to ask more questions. You are back in rapport and you know how they are thinking. You have the reasons for the objection. You will also have been listening intently to their answers. You will have been looking out for stated “beliefs” in the language that they are using. Getting the belief or beliefs that are causing the objection is the key to overcoming it. A belief is stated as a fact. The truth. The way that it is. The thing is that different people can have different beliefs about the same thing. Each of them thinks that their belief is true. Beliefs can and do change. Presented with the right facts and evidence someone can easily change a belief. “I believe that it is going to rain tomorrow.” This may stop someone from planning an outdoor sporting activity. Presented with different facts about the weather, a different weather forecast that person may change their belief. They may end up having a great day enjoying themselves in the fresh air. The key is to identify the exact belief. “I don’t like the colour of your product.” There could be several beliefs here that we would need to investigate further. The assumed belief could be that there isn’t the same product in a colour that they do like. Alternatively the belief could be that the value that the product offers them is not greater than the price, considering the colour. Therefore the purchase is not justified. Get all the beliefs that are holding them back from accepting your suggestion, proposal and you are now in a position to answer and address them. This section is like a mini presentation. We are now going to address their beliefs and concerns. We are going to provide evidence that shows them that their concern is not actually a problem (assuming that it isn’t). We are going to explain why it isn’t true, why it doesn’t have to be the case. We are going to explain how the value outweighs the cost to them. We are going to explain all the benefits to them. If the answer is “yes” then we can move on to the next section. If the answer is “no” or “sort of” or “maybe” or “partly” then we need to go back to the beginning of APAC. Ask the question “What is the reason for that?” and go back to Acknowledging. Do this for each possible objection and belief. I can spend more time with my children on my“working from home” days. I am less tired as the hour long commute to the office is wearing me out. I can play golf or go to the gym on one of my days at home as well as doing my work! I can’t see why it would be a problem since I would actually be able to spend the same time “at work” but in a more productive environment. Bear in mind that we are at stage two of four here. We are assuming that I already have great rapport with my boss and am in a position to influence. I then need to probe. I ask “Out of interest. What are your main concerns?” This is a nice open question and will give them a chance to tell me the real reasons why they are not giving their consent. I now need to answer these objections. There may be more still hidden objections to come but we need to tackle them one at a time. I choose one that I know I can handle easily first of all – Getting hold of me. I say “Boss (I’d use their name), you know that I always take my work seriously and I would want my work output and efficiency to improve rather than suffer. There are personal reasons why working from home would be good for me but also I think that my work performance could also benefit. I would always have my phone switched on and be within reach of my emails. I would effectively be at my desk, just a different desk. So you would always be able to get hold of me just as you can do now.” Pause. “…..And Jane (lady in the same office) works from home some of the time and it seems to work well.” This neatly handles the “company policy” issue without telling them that they are wrong (which would create resistance). How could they say “No” at this point? They may raise other objections at this stage. If so I can cycle through the APAC model again until I get my outcome. My outcome was for agreement from my boss to consider my proposal. 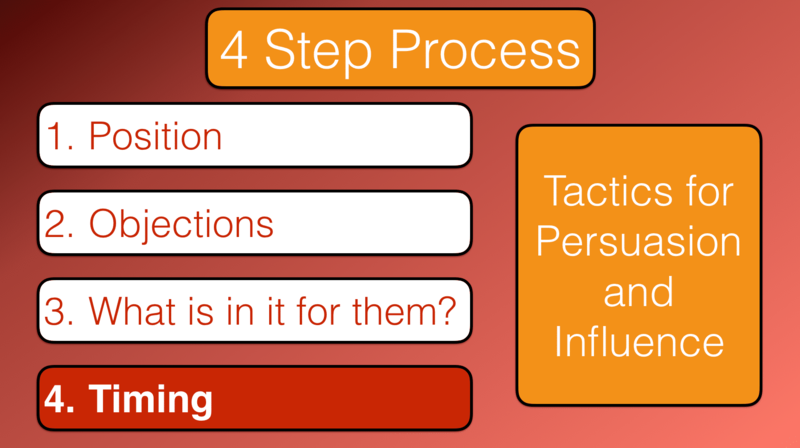 I can then move on to stage three – explaining what is in it for them. Now go back to your list of objections. Using this APAC process write a script for overcoming each objection. Acknowledge, probe, answer and confirm. 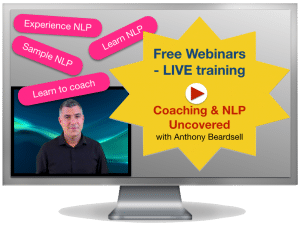 Learn the key communication skills illustrated in this series by joining us on one of our online NLP courses.